All of us have a little bit of Creativity inside us!!! Let me show you how to find it!!!! Welcome Crafting friends to the It's My Birthday" Blog Hop. Thank you for joining and helping Rachelle celebrate her birthday. Those who know her know that she loves many things but one thing she loves the most is crafting. So she decided to host this fun celebration with some of the most talented crafters that she knows. She does have a few rules for this hop, in support of each crafter and the time they have put into their work, to be eligible for the "Grand Prize" you MUST visit each blog and leave a comment for each day of the blog hop and also become a follower at "Creations By Rachelle"
Have fun and enjoy all the wonderful projects created by some wonderful talented friends. If you have came from Linn's blog you’re on the right track. If not, and just found this hop, you can go back to the beginning HERE and hop along with us. This hop runs from July 22-24th, so you have plenty of time to make it all the way through the hop. Check out each blog and see what each blog has to offer for BLOG CANDY! Tell your friends about the hop on your Facebook, Twitter, and link it here for an extra chance. Ok for my last project it is another one of six invitations that I made for my daughters third birthday party we are having next weekend. I have become addicted to embossing powder. I used cranberry embossing powder on the ice cream and the words to help make it pop. I made this invite using the fanfare workshop from Close To My Heart. I hope you have enjoyed the hop this weekend!!! Thanks for all your comments and becoming a follower. 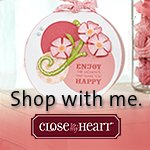 If I get to 100 followers during this blog hop I will be giving away a stamp set from Close To My Heart! You next stop is the Oh so talented Kristy! Happy Blogging!!! That is so cute! You are very creative. I am a follower of yours. Stop by my blog if you get a chance and say hi. Have a great day. Super cute card. I'm a follower of your blog. Love the invitation and the great embossing. Love the invite -- the embossing is perfect! I love to get the handmade invites, cards, etc! Such a cute invitation!! I love the little ice cream cone! Isn't embossing powder the greatest?!?! Very cute luv the emossing! Thanks for sharing. I love the look of this card and how it works! Thanks so much! Awesome invitation! Happy birthday to your little one. I'm a new follower and would love to have you stop by my blog if you get the chance. Have a great week! I apologize for missing you yesterday, great project! Here for the recap. thanks for sharing Love those invites! Thanks for leaving a comment I love feedback!! God Bless!! !